Wales' Ashley Brace, the WBC International bantamweight champion, will challenge Melania Sorroche for the vacant European title at the Newport Centre on Saturday, 9 December. 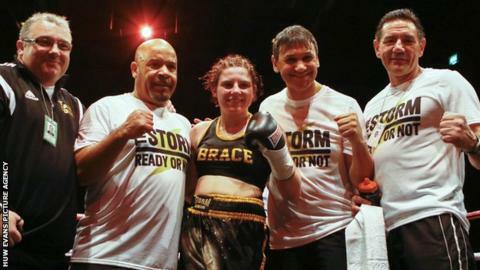 Brace, 26, beat Alexandra Vlajik by TKO in April to claim the WBC title. The Ebbw Vale-based boxer is undefeated in seven fights since turning professional in 2015. "It is a dream come true for me to fight for such a prestigious title at home in Wales," said Brace. "These are the big fights I crave and I can't wait to make Welsh boxing history by being the first female fighter to win the European title." Sorroche is expected to provide the toughest test of Brace's career so far. The Spanish fighter's record stands at 13 wins, two defeats and one draw. Winning the European title would put either boxer in prime position to challenge the WBC world champion Yazmin Rivas in 2018.